We are thrilled to welcome a newish edition to the Quartyard family! You may recognize the owners, Ashley Kaye and Chris Mitchell, as they were two of our favorite baristas at the former cafe, Meshuggah Shack. Together, they created Seahorse Coffee. Seahorses like to travel in pairs and we are stoked that they swam their way to #YourCityBlock. We sat down with Ashley and Chris to learn about their caffeine fueled dreams and aspirations. 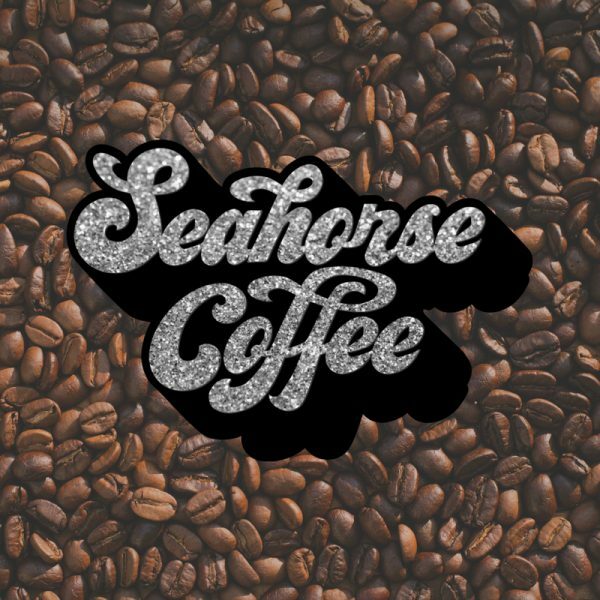 Where’d the name Seahorse Coffee come from? Ashley: Chris and I have been friends for 10+ years. Over that time we’ve gathered a large group of closely knit friends, we call our group the Seahorses. It evolved from a joke someone made at the pool and just kind of stuck. As far as nature is considered, the seahorse is a bit of an odd critter, so are we. I like to think we all end up finding our tribe as we travel through life, the kooks found each other and called themselves seahorses. Chris: When we were kicking around ideas for names, Seahorse came up and there was no letting go. Our buddy Chad made a sweet seahorse souvenir poster for an epic Summer Solstice pool party and it was a really strong image. I am still really inspired by that poster even 6 or 7 years later. Ever make coffee for a celebrity? If so, what’d they order? Ashely: Brandon Maurer (the relief pitcher for the Padres 2017) used to come by the Meshuggah Shack at Quartyard before home games to get our cold brew. We called it Maurer Power. It took us a few visits before we worked out who he was, super cool low key dude, I’m sad he got traded. Chris: Brandon was definitely a celebrity highlight at the last Quartyard location. When I started serving coffee at Peet’s like 18 years ago, I had the pleasure of pouring drip coffee for Rob Halford fairly regularly. He is pretty metal. 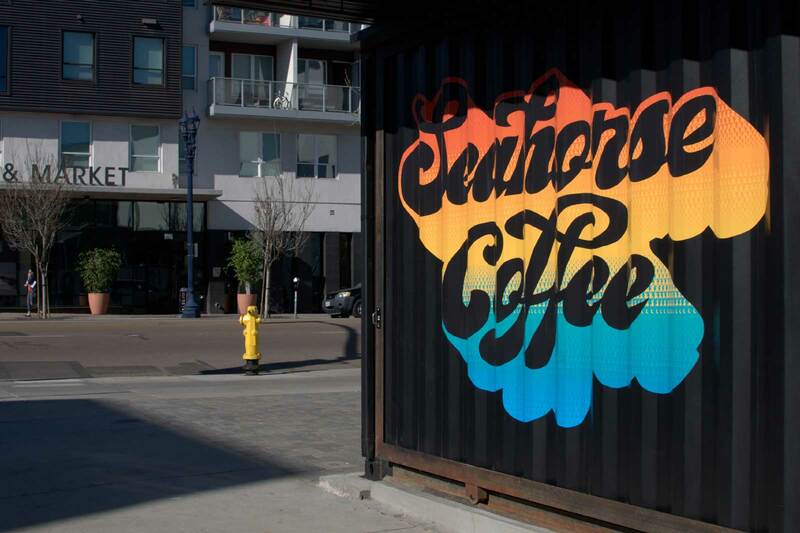 Describe the vision of Seahorse Coffee in 6 words or less. Chris: Locally roasted smiles… also dogs! Grossest thing someone has put in their coffee? Ashley: Vodka…Whiskey is the obvious choice. What specialty drinks should we be excited about? Ashley: I’m excited about the ‘Big in Japan’ (and you should be too) it’s a Raspberry White Mocha with whip cream and a Pocky stick! What is the most amount of espresso shots you have had in one day? Ashley: When I was first learning to pull shots my teacher had me taste all of them. I probably had the equivalent of 8 or so shots that day. Ashley: We are open at 7 in the morning for now, quitting in the afternoon as needed. 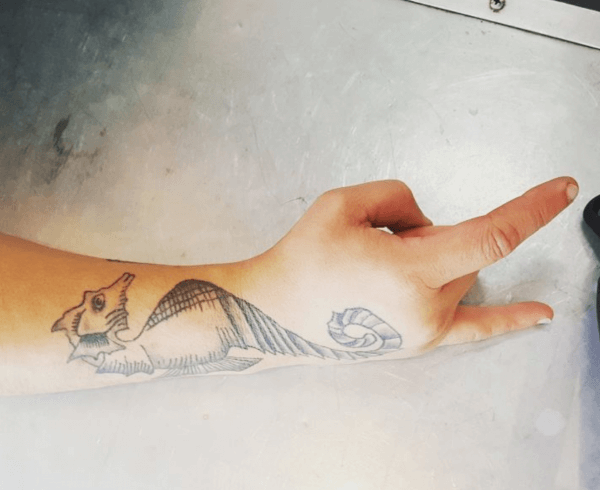 What is the best way to stay in touch with Seahorse Coffee? Chris: Ash is on top of the Facebook account and I try to keep up with the Instagram. Have you ever looked a seahorse in the eyes? Chris: Every day brother, every day. Stop by Seahorse Coffee for those morning goods!